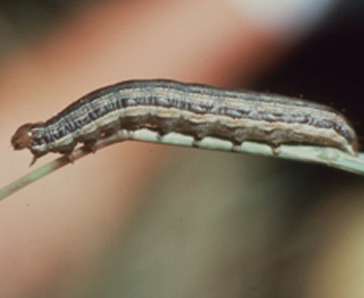 Armyworms are plump, careless, striped caterpillars that feed on grasses and grain crops. They are so named because of their habit of moving in large numbers from field to field as they exhaust their food supply. It can be very disconcerting to a homeowner, when they see their lawn being mowed down by an army of caterpillars that seem to appear overnight. True Armyworms can be found across the United States and in southern Canada. Fall Armyworms are mainly located east of the Rockies and can be a major insect pest for warm season grasses, especially Bermuda grass. These worms can produce from five to 10 generations in a year. We usually see the most damage from the summer and early fall hatch-outs. The adult female moths may lay up to 2,000 eggs in clusters of 25 to 100 on the blades of grasses. 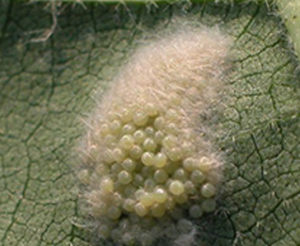 These eggs are round, white and side by side and may be partially covered with some of the scales from the female moth’s body which may give them a “hairy” appearance. Moths will also be attracted to lay eggs on white, yellow and red test plot flags just as they will on red markers around a football field full of lush tender grass. These egg clusters are an indication of large numbers of worms to come. Eggs normally hatch in six to ten days and the young caterpillars begin feeding, especially at night or during cloudy weather. This larval or caterpillar stage is the stage we most often see and also causes the damage to our forages and lawns. The larvae will progress through six instar growth stages in three to four weeks, with the last instar being the largest and consuming 80-85 per cent of the foliage eaten during the insect’s life. Full grown larvae then pupate in a silk cocoon usually under leaf litter or in cracks in the soil for seven to 10 days. The moths will emerge from this stage and the cycle is started over again. Normally, when the moths emerge, they tend to fly northward, sometimes very long distances, 100-200 miles before they begin to lay eggs. The entire life cycle of the insect may take anywhere from 24-30 days and is somewhat temperature dependent. 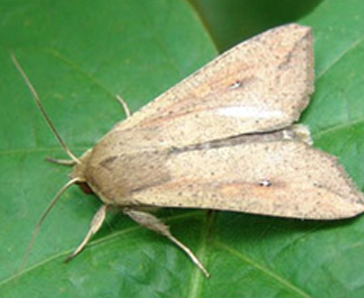 The adult true Armyworm moth is pale brown to grayish brown with a wingspan of about an inch and a half. There is a small, distinct white spot in the center of each forewing. 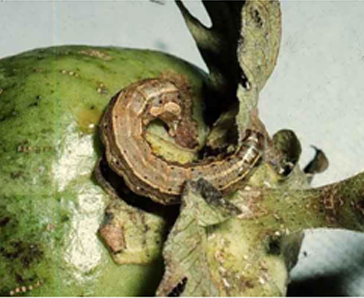 The larvae are grayish green to greenish brown in color and have two pale orange stripes along each side of the body. The head is covered with a net-like pattern. When disturbed, the larva will roll into a tight ball. The larvae cannot survive the cold winters in the northern part of the U.S. New populations arrive from adults that have flown up from warmer climates. In the southern states, the first generation can be seen as early as February. In the northern states, the first populations generally are not seen until May. True Armyworms favorite food is corn and small grains, but they will occasionally feed on turf grasses. Therefore, they are not usually seen as a major pest problem. Their feeding habits include skeletonizing leaf blades or chewing leaf edges. 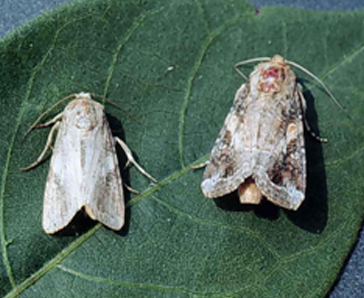 The adult fall armyworm moth is dull colored, and has white blotches on the wings, which are about an inch and a half in length. The larval will range in color from light green, to olive green, to nearly black and have longitudinal stripes along their sides. They look very similar to True Armyworms, but have an inverted Y on the head along with the net- like pattern. The favorite food of Fall Armyworms seems to be Bermuda grass. When populations are large, the larva will climb up onto the grass blades as if they were enjoying the sun. If disturbed, they will drop to the ground and roll up into a tight ball. They are very gregarious in their feeding habits and will quickly move across the lawn, chewing grass blades all the way down to the crown. As a homeowner it’s possible to treat small outbreaks of Armyworms yourself but if not done correctly this can turn out to be a large infestation that in a matter of days could destroy your yard. Most homeowners are not equipped to treat large areas and therefore I recommend contacting a pest control professional.